To end a great year, here's a summary of the noteworthy and the memorable in brand design during 2012. The "logo round-ups" track logo changes that occurred during the past month and are quite popular. Unfortunately, there are always plenty of noteworthy logo changes that miss the deadline to be included in the monthly "logo round-up". In order not to let them pass by unnoticed, here's a special logo round-up that gathers noteworthy logo changes that occurred during January-November this year, but didn't make it into a logo round-up. From now on, all three brands will be represented by a glowing yellow and orange heart, nick-named "The Sunny Heart". The changes will also apply to the group hotel chains, Sunwing and Sunprime. Having a common visual identity allows both the travel operator and the hotels to be part of the same unified brand experience. In May this year, Australia's leading law firm Allens Arthur Robinson formed an alliance with Linklaters, a global law firm head-quartered in London. This means Allens is Linklaters' partner in Australia, Linklaters is Allens partner in the rest of the world, and the two have agreed to form joint-ventures in Asia. Reflecting the fact that the two firms will work together, they also adopted a unified corporate identity, developed by Australian design agency Hulsbosch. Allens Arthur Robinson dropped its two former names to become Allens. The Australian firm was keen to have its name first, a decision that also makes sense pronunciation wise. The new identity would use the same typeface as Linklaters global identity, with Linklaters set in its established magenta and Allens would use a blue shade. The two colours are equally strong and have almost the same lightness. Two arrows separate the two equal brand, while also bringing them together. This arrow motif is also used extensively on stationery and other applications. Cabulous, a mobile app that helps people order a taxi, was relaunched last week as Flywheel. 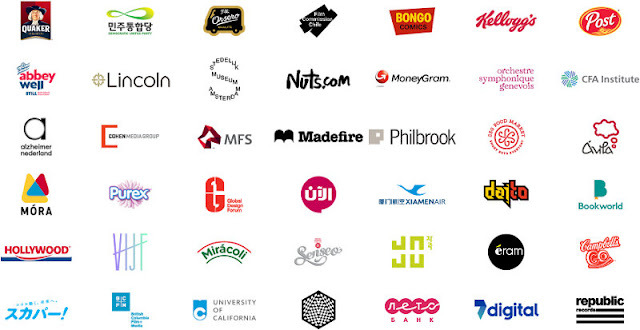 The new identity was developed by Moving Brands, who are promising more information in the future. Until then, we have a nice icon portraying a wheel with wings, that perhaps reminds one of the letter F. It lives in a clean vivid visual environment. Jimmy Dean is a brand for meat-based food products – including something called "Pancakes & Sausage on a stick" – founded by a country singer of the same name and now owned by Hillshire Brands. Back in October it started rolling out a refreshed package design that is described as more consistent and contemporary. This also includes a new simplified logo with a rought stamp effect. Nestlé Docello is a new brand for dessert mixes and sauces from Nestlé that mainly targets the professional sector, such as restaurants and caterers. It was introduced earlier this autumn for a range of products that until then had carried generic Nestlé branding. The new identity was developed to remind one of Italian delicacies and involves new colour-coded packaging. TV4 is Sweden's most watched commercial TV channel, founded in 1990. Yesterday, December 13, it introduced a new on-air graphics package. The previous graphics package was introduced in September 2006 and has had a very long run. The idents featured presenters of TV4 programmes in a red backstage environment. In the new look, TV4 reaches out into the Swedish reality. 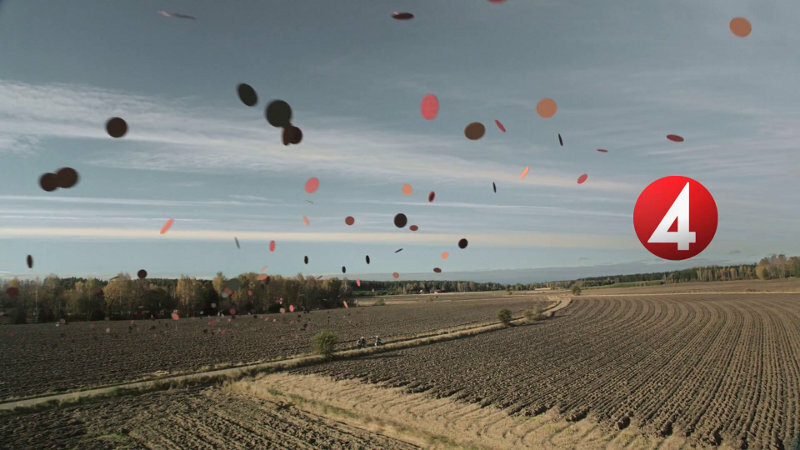 Different shots of Swedish landscapes have a cloud of dots in different shades of red flying through them. The dots are motif that TV4 has used in various forms for several years, and the new look was created as an evolution of that. The new look was developed with broadcast agency Fireplace. Chimney Stockholm did post production and animation while music was composed by Magnus Frykberg and Gustaf Thörn. Rebel Sports is an Australian sporting goods retailer that bills itself as the largest such retailer in the country. In November it introduced a new brand identity, created by Australian branding agency Hulsbosch. The name Rebel now has such high brand awareness that the word "sport" could be dropped from the logo. The new logo is a simple lowercase wordmark with a flipped E to signify healthy competition between individuals or against oneself. Using simple typography, a yellow-black-white colour scheme and monochrome imagery, the visual identity has been applied to all branded assets both instore and on advertising. Serla is a Finnish brand for hygiene tissue, such as paper towels and toilet paper, owned by a company called MetsäTissue. Over time it has been extended to Sweden, Denmark, Norway and the Baltic states. This year, Serla introduced a refreshed brand identity along with new more environmentally friendly packaging and improved paper quality. The new packaging is designed to improve shelf navigation and introduces a simpler logo that gives up the leaf texture of its predecessor. The "Serla squirrel" that is the brand's mascot still takes a prominent spot on the packaging. Direct Énergie is a French power company, formed in 2003 after the energy market was opened up to private competition. In July this year it merged with another electricity company called Poweo. This presented the opportunity to introduce a new corporate identity, which was launched last week and was created by Dragon Rouge. The new symbol is a circle, representing unity and togetherness. Its yellow colour is for warmth and optimism and the wordmark is set in rounded lowercase letters, which should convey proximity to consumers. Back in January 2011 when NBCUniversal became majority-owned by Comcast and introduced its new simple purple logo, there was plenty of uproar about the removal of the NBC peacock. In an unexpected move, Comcast itself has suddenly started using a new logo that prominently features the NBC peacock over a wordmark set in thin capital letters. Becoming the symbol of a communications company marks a change in use for the peacock, that until now has mainly been associated with television and associated media. The new logo was unveiled on Monday, December 10. At the moment we only have the primary corporate brandmark, but there are several other Comcast-branded assets, such as the Comcast Sportsnets, that will presumably have to be updated as well. Last week, the large Turkish bank Halkbank introduced a new brand for its credit cards, until then branded as "Halkcard". The new brand was developed by Saffron Brand Consultants who were selected in competition with several other major brand consultancies. They developed both the name and visual identity. Developed "as a tool that’s there when you need it most", the brand's name means "signature" in Turkish. This is reflected in the logo and background patterns, inspired by islamic art. Here's a round-up of logos unveiled this past November. This is usually a slow month, but there were still a good crop of significant and interesting project that you can read more about below. In late November, Apple introduced iTunes 11, the latest version of their popular media player. It comes with a new version of the iTunes icon. The icon was last updated two years ago when iTunes 10 was released. It was a significant change that confined the CD that had been used until then to history. As Steve Jobs explained at the time, the CD was becoming increasingly less relevant as music consumption was changing. This recent update is much less notable. The note has switched from black to grey and the entire is somewhat more three-dimensional. It also comes with a different variety of app icon glare. ID is a new chewing gum brand launched earlier this autumn by Kraft Foods (now known as Mondelez) in the United States. Its packaging was developed by Landor Associates in Cincinnati. Primarily targeting teens, the packaging features original artwork commissioned from young emerging artists around the world. The artwork is hidden by a transparent cellophane wrap the consumer has to remove to see the artwork. This encourages interaction that should foster a relationship with the brand. The packaging carries a "by Stride" tag, linking it to a more established gum brand. Comviq is a Swedish mobile telecommunication company, founded back to 1981 when it was the first company to challenge the state monopoly on mobile telephony. It is owned by Tele2 and operated as a separate brand, specialised in prepaid cards. Last month, on November 7, Comviq launched its first mobile subscription, and also relaunched its communication built on its core proposition of simplicity at low cost. A new corporate identity has been designed by Swedish design agency Kurppa Hosk. Visually, the new look relies on an eccentric custom typeface, a few vibrant colours and a dripping paint motif. The three core product brands – Amigos, Kompis and Fastpris – are colour-coded with individual logo-types. Tourism Australia is the official organisation responsible for promoting Australia to tourists. Today, December 6, it has unveiled a new logo which is an evolution of the kangaroo logo used up until now. Interbrand Sydney was the agency behind this redesign. The new logo is said to feature a "more modern design and vibrant colourful palette reflecting the rich and varied landscape of Australia". It is also said to be more sophisticated and better aligned with Tourism Australia's positioning. Most of you are probably familiar with Weight Watchers, an American company that offers dieting products and weight loss guidance. On Monday, December 3, Weight Watchers launched a new weight loss program called Weight Watchers 360°. The reason you are reading about that here is that at the simultaneously the company launched a new corporate identity, created by Paula Scher at Pentagram. Weight Watchers itself says the new identity "brings to life the transformation members experience when they adopt a new lifestyle that can lead to significant weight loss". The gradient from dark to light is the visual expression of the transformation Weight Watchers costumers go through. The typeface is designed by Jeremy Mickel and is a customisation of his Fort typeface. Terpel is a major Colombian oil and gas company, the largest fuel distributor in the country. This week, it unveiled a new corporate identity, developed by independent brand agency CBX. It will be launched with a gradual update of its stations network. It should be associated with values such as proximity, dynamism, modernism, service, technology, familiarity, uniqueness, solidity and reliability. The previous logo was introduced in 2006 as an update of the sun logo used up until then. This is allegedly the fourth logo makeover in the company's history. TeleFutura is a Spanish language TV network in the United States. Established in 2002, it competes with Telemundo to be the second most watched Hispanic TV network. Univision, the market leader, is also the owner of TeleFutura and yesterday, December 3, it announced its intention to rebrand TeleFutura and change its name to UniMás on January 7, 2013. This is part of an enhanced commitment to more action, drama and sports for younger viewers, but will also link the network closer to its parent company. Broadcast design agency Troika developed the logo and brand identity for the rebranded network. It has certainly been a year of rebrands for Spanish TV in the United States. Telemundo unveiled a new logo in May, and was followed by Univision in October, who also announced a new look for the largest Hispanic cable channel Galavisión in November. In addition to this, News Corp launched its new MundoFox network in August. Lätt & Lagom is a Swedish brand of spreadable butter and vegetable oil, introduced in 1974 and manufactured by Arla Foods. This autumn, it has introduced a new package design. 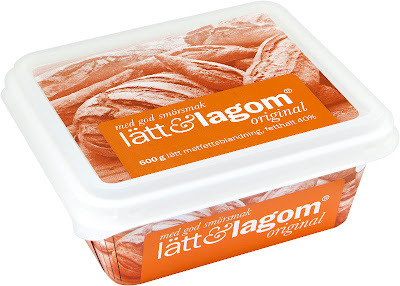 The previous very modern design has been made a little bit friendlier with an image of sourdough bread on the packaging and a serif ampersand included in the logo. The Evangelical Lutheran Church in Denmark – better known as the Church of Denmark, or Folkekirken in Danish – is the state church of Denmark. Almost 80 percent of the population are members of the church, safely making it the largest religious community in the kingdom. Over the weekend the church unveiled a new visual identity, created by Jacob Jensen Design. This is apparently the church's first attempt to introduce a common identity, and it hopes it will be widely adopted by the over 2000 parishes. The new icon is made up of a circle and a cross, filled with numerous smaller icons. The cross is a simplified version of the Dagmar cross, that has historical significance to the church, and the circle should represent a baptismal font, as it is through baptism that people become members of the Christian community. The smaller icons consists of nine distinct symbols relating to Christianity that are repeated several times. The church has also not selected a specific colour for their new logo, instead it can be reproduced in eight basic shades, plus the rainbow version seen above. The typeface, Garamond, was chosen to break with the motley composition of the icon. TVA is the most watched television network in Quebec, and by extension the most watched French language network in Canada. Last Thursday, November 29, it unveiled a completely new logo, reportedly developed with an agency called Sid Lee. The previous logo was allegedly introduced 22 years ago and featured a triangle, a square and a circle, perhaps taking inspiration from its English counterpart CTV. The new "dynamic" logo is said to reflect that dynamism of TVA and its brand, standing as "a symbol of a strong brand modernising itself, a brand synonymous with innovation, agility and creativity". On screen, the logo will be seen both in different colours as well as different 3D treatments that change depending on the programme.